PUDR welcomes the release on bail of four workers of Reliance Energy/ Infrastructure Ltd. (REIL) and trade union activists implicated under numerous sections of the draconian Unlawful Activities Prevention Act (UAPA) for alleged Maoist links. The workers were released today on default bail after the 17 December order of the Bombay High Court setting aside the extension of time granted to ATS Mumbai to file the chargesheet in April 2018. Months before 6 June and 28 August, when 10 rights activists were arrested under UAPA on fabricated connections to the Bhima Koregaon violence, workers at RIEL were the first to be targeted for alleged ‘Maoist’ links at Elgaar Parishad. The decisive question for democracy in India: How should it deal with citizens who think differently and are annoying or inconvenient to ‘us’? In January, eight men working in private firms were arrested by the ATS and booked under the Unlawful Activities (Prevention) Act. ATS claims that they were involved in raising funds for the banned Communist Party of India (Maoist). 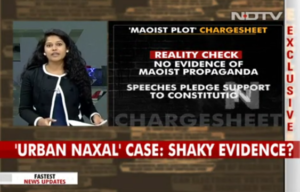 Video: Maoist Plot: Missing Evidence? We examine the 5,000-page charge sheet filed against so-called ‘Urban Naxals’ to find more questions than answers. Teltumbde had moved a petition before the court, seeking quashing of the FIR. The Bombay High Court on Friday dismissed activist Anand Teltumbde’s plea seeking quashing of FIR against him in the Bhima Koregaon case. The court, however, granted him protection from arrest for three more weeks. Exactly 11 months after workers of Reliance industries were arrested on charges of UAPA and for their alleged connection to BhimaKoregaon case, the Bombay High Court, has, on December 17, has set aside a Sessions Court order granting extension of time beyond 90 days period for filing charge sheet. This will now make it a little bit easier to approach the courts for bail. MUMBAI: Civil rights activist Anand Teltumbde, named an accused by the Pune Police in the Elgar Parishad-Bhima Koregaon, Monday denied all charges against him, urging the Bombay court to quash the FIR against him.